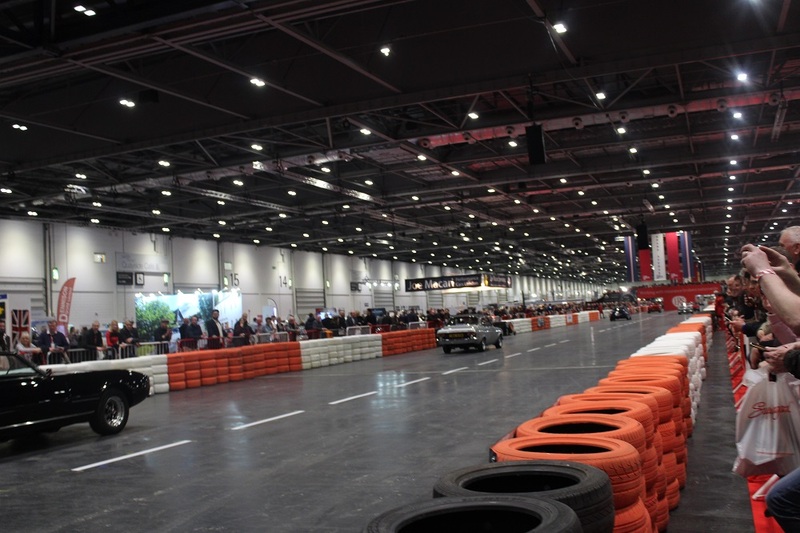 Last month we attended our first show of the year, The London Classsic Car Show at Excel. Having attended the show before we knew it was a great event with a mix of classic cars, unusal cars, supercars and motorsport related products. We thought it would be the perfect event to showcase our latest demos. Of course as it was a classic car show we had to bring our loved 1969 MK1 Ford Transit, usually only brought out in the summer months! The show launched on a Thursday evening for a preview night. The new Jaguar Lister Thunder supercar was launched on the night with a demo on the runway! Thursday evening had invited guests and was less crowded for those who wanted to be able to spend longer looker at potential purchases. The parade of cars started on Thursday, and we were in the perfect position. Our stand was opposite the runway and the Sprinter gave us a vantage viewing point. The show was busy, and our team were showing the vehicles to families, car lovers, businessman and young budding car enthusiasts. It was great seeing the publics reaction when they walked past and caught a glimpse of what was inside. The Classic Car show gave us the perfect back drop to show the Monacos insulation and privacy. We could invite people inside, close the electric blinds and doors and illustrate how soundproof and private the Monaco's are. They shut out the hustle and bustle of the show deafening sounds of the engines! But of course the true star of the show was the 1969 Ford Transit, loved by everyone who walked past. Our Transit is a bit like Marmite, some people hate it becuase we haven't kept it in its orginal state. Others love it becuase we have given it a new purpose and brought it back into use. The Ford Transit is an iconic van, refered to as the 'Back bone of Britan' by some. But unfortunately the 1969 version is no longer the ideal vehicle for the working man or bank robber ha! We feel our conversion gives the vehicle a prcatical use its perfect for a day out. As we visited the show before we knew there was lots to look at, and there would be little chance we we would get to see it all. Luckily we managed to sneak off during set up to look at the other exhibitors stands. We loved the mini bespoke cars for kids that were designed like classic cars. This year the show had a special feature on 'getaway cars' from movies and tv shows, curated by Phillip Glenister. This section had its own MK1 Transit it was great to compare it to ours. We had a great time showing Phil Glenister around our own getaway car the Ford Transit's. We were lucky to have a few visitors to our stand including Danny John Jules and his friend presenter Steve Keys from Easy Riders. It was a great few days, with plenty of positive feedback. We have to say a big thanks to our client Oracle Chauffeur Services, who did the VIP transfers for the show in their 8 seater Monaco Sprinter.